Rangers captain James Tavernier has called on clubs and security staff to prevent a repeat of Friday night’s shocking scenes when a fan confronted him during the 1-1 draw with Hibs. Hibs chief executive Leeann Dempster was forced to apologise to Tavernier after a pitch invader leapt from the East Stand to square up to him. 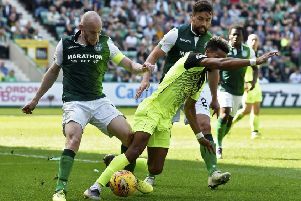 The incident occurred despite Hibs chiefs drafting in 50 extra stewards after a glass bottle was thrown at Celtic ace Scott Sinclair just six days earlier. Scottish football has seen a worrying rise in unsavoury episodes this season with missile throwing and unacceptable chanting among the incidents that have marred the game. Tavernier wants more done to stop incidents like Friday night’s. The Englishman said: “Every time I have played at Easter Road, that stand is normally the rowdy bit where their fans are saying stuff. “First and foremost, no fans should be allowed on the pitch. That is down to the security. It shouldn’t happen. “No player should be targeted by fans going on the pitch or having coins thrown at them. We had an incident a few years ago where they raided Hampden. These things shouldn’t happen. “That is down to the clubs and the security to stop this, but fans shouldn’t be trying to intervene. “It’s stupid. It shouldn’t be allowed at football stadiums. Fans should be enjoying the game, they shouldn’t be able to jump on the pitch and interfere with any players. The confrontation came just as referee Steven McLean blew the half-time whistle. The supporter from the East Stand brushed past a steward before leaping the hoardings to enter the playing surface. Tavernier was bending down to pick up the ball but the man kicked it away before pushes were exchanged between the pair. Two police officers then moved in quickly to arrest the supporter. Dempster admitted after Friday’s 1-1 draw she was “embarrassed” by the affair and refused to rule out closing Easter Road’s trouble-spot sections if fans continue to step out of line. Tavernier added: “It is one of those things where your instincts just kick in. “Someone has come on, I didn’t know what he intended to do when he booted the ball and caught us.